TJ Upper Coilover Mounts Front for Jeep Wrangler TJ 1997-2006. These are the upper coilover mounts we originally designed to use on Daddy Longlegs. They are made of CNC laser cut, brake-formed 3/16 inch plate steel. They accommodate coilover shocks with a 2 inch diameter shock body. The upper tabs hold the shock bolt securely in double-shear. Since building Daddy Longlegs we have used these on several other TJs and LJs. We have even used them on a YJ (Papa Smurf), with some extra work, although they are Not designed to be as proper of a fit on the YJ frame. These are provided as a DIY, or builder component. No installation instructions are included. They are intended for those who possess the fabrication skills to design and build their own coilover conversion setup, but they can use these as a time-saver. Our tech line offers no assistance in the use of this product. If you are Not comfortable observing, measuring, fabricating and figuring out how frame and suspension components fit and work together, please do Not attempt this project. If you are comfortable with those things, you will Not need any assistance or explanations on how to install them. 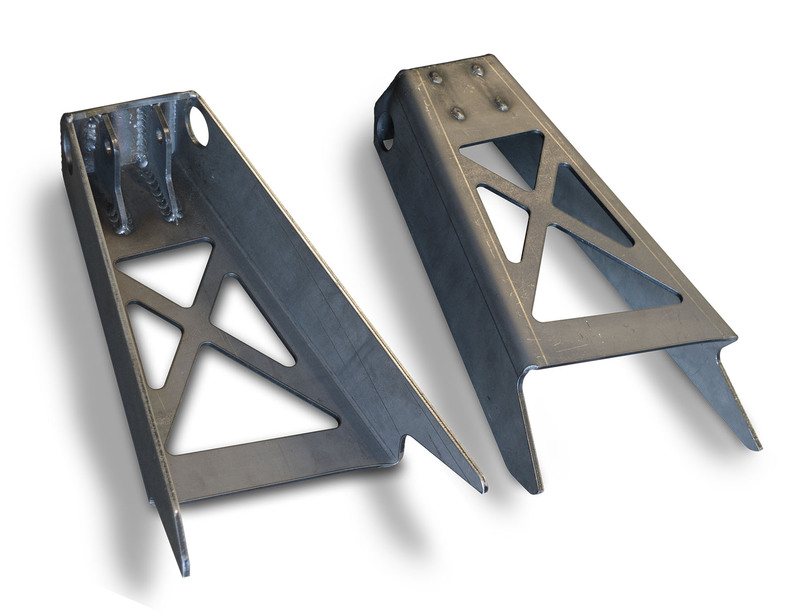 Also Note that these are designed for use with Full-width axles, as they lean outboard from the frame rail somewhat. And you will be on your own for designing and building the lower coilover mounts on the axle, as well as your suspension link mounts.